Lucknow Metro is yet to begin. This false photo has been shared by 4910 people and seen by Lakhs. 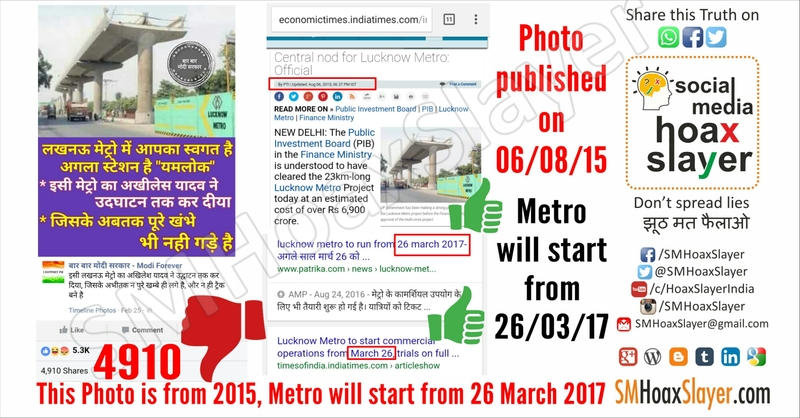 It claims that Akhilesh Yadav have inaugurated & started Lucknow Metro even before completion of pillars & Tracks claiming it to be negligence which may result in death of people. It’s completely false. The photo used here was taken in August 2015 when project was under construction. The Metro has been completed, trial runs have been made. But it has not been started for public yet. It will start on 26th March 2017. ← Don’t incite Riots ! Are drugs being smuggled stuffed in Onions in India ? Can AAP win Bawana by Photoshop ? World Map on Holy Cow ! Who did it, god or photoshop ?